Autumn is in full swing and this is the prime season for finding the sometimes elusive devil’s cigar mushroom (Chorioactis geaster). This mushroom is a very special mushroom because it can only be found in certain counties in Texas (Dallas, Hunt, Denton, Collin, Tarrant, Travis, Hays, Guadalupe) as well as two locations in Japan (Nara and Miyazaki prefectures). Tarrant county, of course, is the home of River Legacy! This mushroom is found growing on or right next to stumps or dead roots of cedar elm (Ulmus crassifolia). It does not grow on any other tree here in Texas. In Japan, it has been seen growing on oak trees (Quercus spp.) as well as Japanese sapphireberry (Symplocos myrtacea). It essentially looks like a dark brown cigar but changes its appearance once it opens up to release its spores. When it does that, usually a hissing sound can be heard and eventually the mushroom looks like a star. 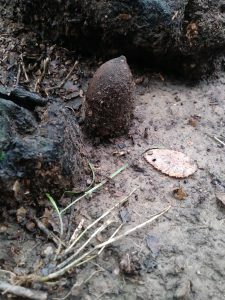 This is why it is also known as the Texas star mushroom! Mycologists (scientists who study mushroom and related organisms) do not yet know why it is found only in Texas and Japan. A 2004 genetic study showed that the two populations have been separated since at least the early Miocene (roughly 19 million years ago!) This rules out the possibility that humans could have moved from Texas from Japan or vice-versa. Therefore, it is still not known why it has a disjunct distribution. Just another interesting fact about this mushroom! 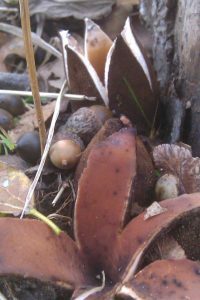 The devil’s cigar fruiting body usually appears between October and April since it prefers somewhat cooler and wetter weather. This year, it appears that the rain we have had for the past month is creating good conditions for it. 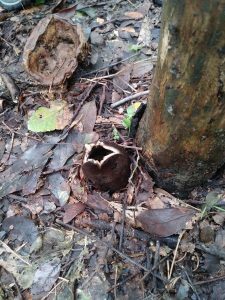 We invite you to take a look around River Legacy Park and the trails around River Legacy Living Science Center to see if you can find a devil’s cigar fruiting body. Look around dead stumps of cedar elm trees. No worries if you can’t find it; You can always visit our Discovery Room, where you can interact with a replica of a devil’s cigar and hear for yourself the hissing sound it makes when it releases its spores! ← Why is water important anyway? I’ve always enjoyed the various mushrooms I’ve seen growing in the woodland but I don’t think I have seen, or perhaps didn’t realise it, this particular specimen. It is beautiful.